I greatly enjoyed reading this play over the last few days. It's funny, poignant and well observed. One thing that greatly impaired my appreciation of Miller's masterpiece is the dreadful Penguin Modern Classics edition I inherited from Elisabetta's school days. The paper is the colour of a hepatitis patient's face and the type is pretty crammed. I think I might have preferred a Kindle edition to this. Our edition is priced at £1,75 UK and I think its publication date is 1986. The copyright page says: First published 1949. Published in Great Britain by the Cresset Press 1949. Published by Penguin Books 1961. Reprinted 1962, 1963, 1964, 1965, 1967, 1968, 1969 (twice), 1970 (twice), 1971, 1972, 1973 (twice), 1975 (twice), 1976 (twice), 1977 (twice), 1978, 1979, 1980, 1981, 1982, 1983 (twice), 1984, 1985 (twice), 1986 (three times). But although they've had at least twenty-five years and thirty-five editions to get things right, this edition is littered with a few bizarre typos – bizarre because we are talking about one of the most important texts to come from America since the Second World War. Linda is made to stutter – but only on page 10 – "be-behind the other..."; a full stop is missing on p.18, ironically at the end of the sentence "I don't know how to do it"; on page 72, "Biffs' in town" and "Yeah, Biffs' in" – and so on and so forth. Going back to the play, it made me want to go to the theatre and see it. I hope it's going to be on in London soon. Actually, 101 + 1 as of yesterday. It's the number of books we have sent to the printers since the beginning of the year. Yes, it's not a typo – we've been quite busy this quarter. I'm currently working on the first ever biography of AJ Cronin – and what a wonderful and revealing book it is! It focuses on Cronin's authorial ego and his relationship – stormy at times – with his British and American publishers. There are real gems in his letters and the few other documents he left behind (not much survives – strangely, as Cronin used to sell in the millions all over the world and set Hollywood on fire in the '30s). Gollancz had no time for agents – Alan Davies writes – to him they were “parasitical nuisances put on earth to foment ingratitude among Gollancz authors”. He preferred to deal directly with authors, behind their agents’ backs if he could get away with it. Another interesting bit is Cronin's scepticism about cheap paperback books, which were made available on a mass scale only after his early successes. Cronin kept liking a well-produced book, not agreeing to mass-market paperbacks until after the 1960s (over 30 years after his first book), principally because there was little money in them for him. Looking at the royalty rates he was getting (between 20 and 30% on hardback sales), you can understand why . . . I doubt he'd have subscribed to eBooks. The Bunga Bunga Continues. . . I was intrigued by news of the discovery, in the wake of the New Zealand earthquake, of two "time capsules" among the rubble of the Christchurch cathedral – one a bottle containing a scroll, the other a mysterious metal cylinder, presumably also containing some document. 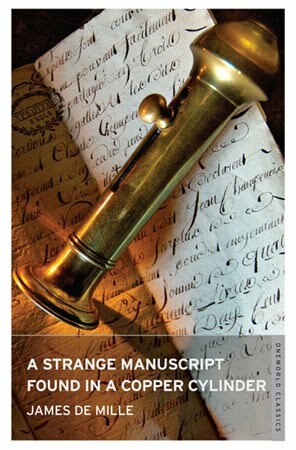 That obviously reminded me of a book we published, A Strange Manuscript Found in a Copper Cylinder, a rediscovered early example of the science-fiction genre by the Canadian writer James de Mille, a cracking story à la Verne. The discovery in New Zealand suggests that copper (or metal) cylinders were indeed used as an alternative way of sending "messages in a bottle" to distant times and places, just like in the novel. Fascinating. I can't wait to know what the cylinder contains.